Although I really love jewelry and often wear a lot of it, I never used to like pins. In fact, I actively disliked them. I thought they were silly, and I disdained people who wore them, because A) they were jewelry for clothes, not people; and B) they couldn't be worn on more delicate garments, without risk of ripping them; and C) they just seemed out of style; and, most importantly D) only old ladies wore them. Every so often someone would give me a pin or brooch, and I would exclaim, "Oh, how nice!" before putting dragging out a trunk I kept at the back of a closet, where I stored all my ugly, rejected jewelry. Now, he doesn't photograph all that well, but trust me: he's really cute. And I have always had a thing for turtles--they're so prehistoric-looking and eccentric and stand-offish--I find it impossible not to love them. And I looked at this guy and thought, "I could stand to pin him to the lapel of a coat," so I bought him, took him home, and wore him a time or two. And I decided I'd given pins a short shrift. Last week, on my final day of teaching, I went holiday festive: I wore a red skirt, a white shirt, and a tweedy green jacket--the very one you see the brooch afixed to. I stood before my mirror and thought, "This would be the perfect outfit to wear that pin with." And I pinned it to the jacket and surveyed myself, all ready to walk out the door, and thought, "I look like an old lady. Actually, I don't just look like any old lady: I look like my grandmother." And I continued to look at myself, trying to decide how I felt about that. And what I decided was that I didn't feel bad. In fact, I decided that one of the nice things about, uh, maturing, is that you can get away with dressing like an old lady. I really sort of liked it, and I plan to do it again. 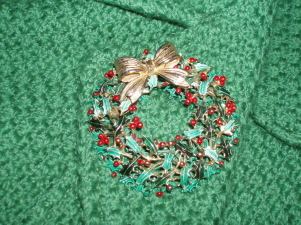 That is one gorgeous brooch, and perfect for a Holly! You could also wear it on a classy black sweater. The same goes for the little turtle. I saw the most lovely brooch on a woman's lapel yesterday. It was a funky-looking gold star. Wonder where she got it. Don't you just love the word matronly? I never hear that word anymore, but I continue to love using it. Sigh. Now if only I knew how to make myself appear thirty and flirty and thriving. 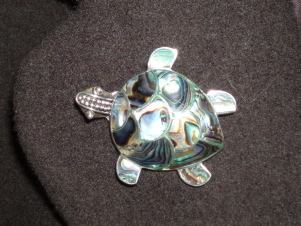 And I love the turtle pin, and also the idea that the wreath would look GREAT on a black sweater or jacket. Glad you like the pins, everyone. SML, you're the only one to comment on the "old lady" part of the post--and yeah, I actually do like the word "matronly," now that I've embraced the concept behind it. This page contains a single entry by Holly published on December 18, 2006 4:01 PM. Christmas Meme was the previous entry in this blog. Baby Needed a New Pair of Shoes is the next entry in this blog.